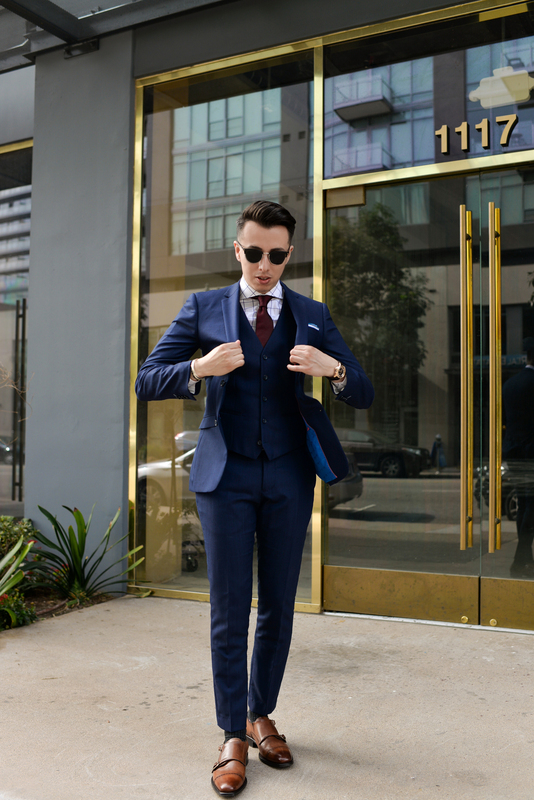 A blue suit is perfect for everyday because of it’s high versatility. There are various tones, textures, and patterns of blue suits to fit your personal taste and needs. The suit i’m wearing today is a rich navy shade with slight texture. With Spring around the corner, it’s the perfect way to add some color into your day-to-day suiting game. I kept my look classic today with a crisp white shirt, and deep hued red tie. I added some of my favorite cognac shaded double monks by Gordon Rush for that little pazzazz that I like. The socks are dark gray, and don’t compete with anything else in the look- I like to keep it that way and let the shoes pop! Your coats point to point should sit right on the Acromion Bone (Pointy part of shoulder). If its too low, your suit will look large and oversized, and if its too tight, the jacket will bunch up around the neck and take away shape. Ask your tailor to properly measure you, to truly figure out the size of jacket you should use.